Edinburgh Woollen Mill TUC day of action cancelled – They’ve signed! We announced a Saturday 23 November day of action at Edinburgh Woollen Mill and Peacocks stores only two days ago. Despite months of campaigning, they had been refusing to join nearly all their competitors and take action to fix dangerous factories in Bangladesh. And then as we prepared the placards and leafleting teams, the Edinburgh Woollen Mill group signed the Bangladesh Fire and Building Safety Accord, a real win for garment workers in Bangladesh. 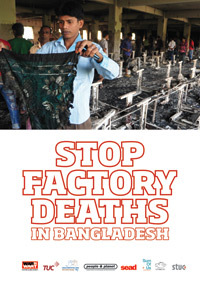 This union-backed agreement commits Edinburgh Woollen Mill, and their subsidiaries Peacocks and Jane Norman, to an independent programme of inspections and safety measures for their factories in Bangladesh. This will make working life safer and more secure for the workers who make clothes for their stores and brands. Edinburgh Woollen Mill have done the right thing by signing the Accord and we welcome their decision. The Accord now has 115 corporate signatories, covering most of the UK clothing industry working in Bangladesh, and many other firms internationally. It’s also a big win for everyone – campaigning organisations, trade unions and individuals – involved in the campaign. Thank you all for your support, which has really made a difference. But Edinburgh Woollen Mill haven’t yet agreed to compensate the victims of last year’s Tazreen factory fire, or their families, as other retailers whose clothing was found in the factory have done. Sunday will be the anniversary of that fire, in which over 100 workers died. Many were injured too badly ever to work again, and the hardship inflicted on their families has been immense. We hope Edinburgh Woollen Mill will add to the commitment they have made this week on the Accord, and contribute to compensation for the victims of Tazreen.